Friday, February 8th 12:00 noon - 1:30 p.m.
NO CHARGE for a guest seat. According to numerous studies, speaking in front of others is cited as people's number one fear more than anything else! It DOESN'T have to be this way! Whether you are giving a 15-minute presentation or an hour-long keynote, your ability to connect and communicate will be essential to effectively getting the audience to take action and move forward. Let's talk about the critical keys to success when it comes to influencing and impacting people via the Maxwell Method of Speaking curriculum. • THE SPEAKING SKILL ESSENTIALS for every leader. • HOW TO CONNECT WITH OTHERS and keep them engaged. • THE POWER OF STORIES - even in the most technical presentations. 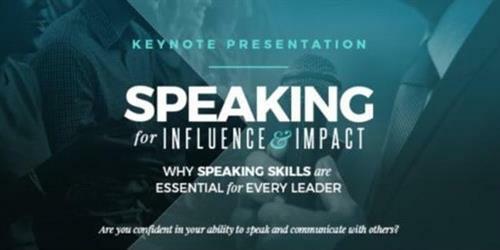 • Why it is important for you as a leader to CONTINUE TO DEVELOP YOUR SPEAKING SKILLS. Don't miss this opportunity for sneak peek's at this new curriculum and learn how being part of the Maxwell Speakers Club - Harrisonburg, one of the first nationwide, can provide you with powerful tools you can use every time you need to effectively communicate with others. **Register today at no charge (or select a $10 option for lunch) to secure your spot and learn how this awesome new opportunity can help you achieve a level of comfort and success you've never considered before! Send your team so they can experience the same level of confidence!